Q. What is Latisse and how is it different than other eyelash products? A. Laitisse (Bimatoprost ophthalmic solution) 0.03% indicated to treat hypotrichosis of the eyelashes by increasing their growth cycle. This includes length, thickness and darkness. A. Mechanism of action is not known. Bimatoprost is a prostaglandin analog. Growth of eyelashes is a result of an increase in the growth phase of the life cycle of eyelashes. Q. How do eyelashes grow? A. Eyelashes grow from a hair follicle and have a life cycle of 5-12 months. Q. Do my eyelashes grow as I age? A. Eyelashes continue to grow as we age; however the growth cycle is shorter and the lashes thin out as we age. Q. What is the examination to determine whether some one qualifies for Latisse? A. To qualify for treatment with Latisse we must do a full examination to rule out any eyelid disease and intraocular pressures must be measured before treatment. Q. What should I expect? When will I see results? A. 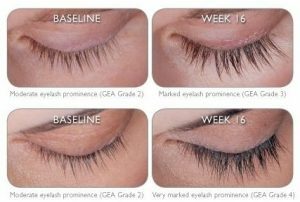 Normally it takes 8-16 weeks: however patients will notice thicker and darker eyelashes in 4 weeks in many cases. A. Call us or go to our website drbarrynolt.com and send a question to our office through our home page. Iris pigmentation has occurred when bimatoprost soulution was administered. Patient should be advised about the potential increased brown pigmentation which is most likely l permanent. Lid pigmentation –Bimataprost has been reported to cause darkening of the skin around the eyelashes. In most cases, this is usually reversible on discontinuation of bimatoprost. To qualify for treatment with Latisse we must do a full examination to rule out any eyelid disease and intraocular pressures must be measured before treatment. Schedule your Latisse Appointment Today!